A new year and a new bunch of stats to sift through for meaning. It definitely seems as if the market is shifting, but some strong performance at the end of the year and a strong start in 2018 has me debating where we’re headed. This year is also the first year without data share between IRES and REColorado and I’m sure that affected our numbers, but how and to what extent is very hard to tease out without massive data consolidation efforts. To keep that variable to a minimum and to match all previous years these stats are all IRES data only. It has been a great time to be a seller since mid-year 2012 and 2017 was no exception. While we did see a shift in the market, sellers still remained in control for most price points. The higher the price point the less seller control we saw. Entry level markets saw sellers choosing amongst many, multiple, strong offers. At the highest price points, sellers were not as fortunate and were much more likely to experience a balanced market. We continue to see wobbles in our stats with different metrics telling different stories. What is confusing is that not only are the different metrics telling different stories but that the metrics themselves are flip-flopping back and forth in their indications. This is very different than what we saw during 2013-2015 when all arrows were pointed straight up. Annual sales numbers saw modest growth, up 6.47% from 2016. Single family homes saw a slightly greater increase at 7.15% while attached homes were up 4.70%. This is one of our unusual metrics, as typically in a strong market like we’ve been experiencing, annual sales numbers increase strongly. This held true during the last strong market we had in the late 90’s as you can see partially above. During this current strong market, our annual sales numbers have been bouncing up and down each year but holding generally in the area of 4,500 home sales. Here is our current level of single family inventory, with 2018 levels setting a new all-time low. That is one of the interesting things about our market, strong price appreciation that isn’t causing more sellers to put their homes on the market. I think this is due to two factors, one the aging of the Boulder County populace and two the lack of new home construction activity we have. According to the State demographer, Boulder County will see a 77% increase in the number of people 65+ in Boulder County between 2015 and 2030 and as a general rule, as people age, they move less. We are also almost done with large scale new home developments in Boulder County unless we dramatically change our land use policies. Without new homes being built in large quantities and with our growing population, you get a musical chairs situation. People don’t want to put their home on the market for fear the music will stop and they won’t be able to find their next home in the County. We’ll be watching this chart this year to see if we again see larger inventory numbers mid-summer like we saw last year. I am becoming more convinced every year that the light red area in the chart above is the new-normal range for our inventory levels due to the two factors we discussed above. With lower inventory levels likely to be a somewhat permanent issue, I don’t see home values dropping dramatically for the foreseeable future. High demand and low supply are always good for prices. The next chart is one of the charts showing that the market is shifting. Overall percentages of properties under contract has been dropping since our peak in the summer of 2016. To me, this shows that the market is returning to a more balanced level but is still strong. The current downward trend doesn’t concern me as an indicator of poor market, just a slowing market. Many of my fellow stats nerds feel that we see price appreciation for any market that is at least 25-30% under contract. If our current downward trend continues to the point that our under contract percentage is approaching that 25-30% level, then this would be concerning. Another possible source of friction that could slow our market is rising interest rates. It seems like we’ve been expecting rising interest rates every year since we escaped the Great Recession and so far we’ve mostly called that wrong. As you can see in this next chart looking at 30 year mortgage interest rates over the last 5 years we’re starting to see some upward movement. 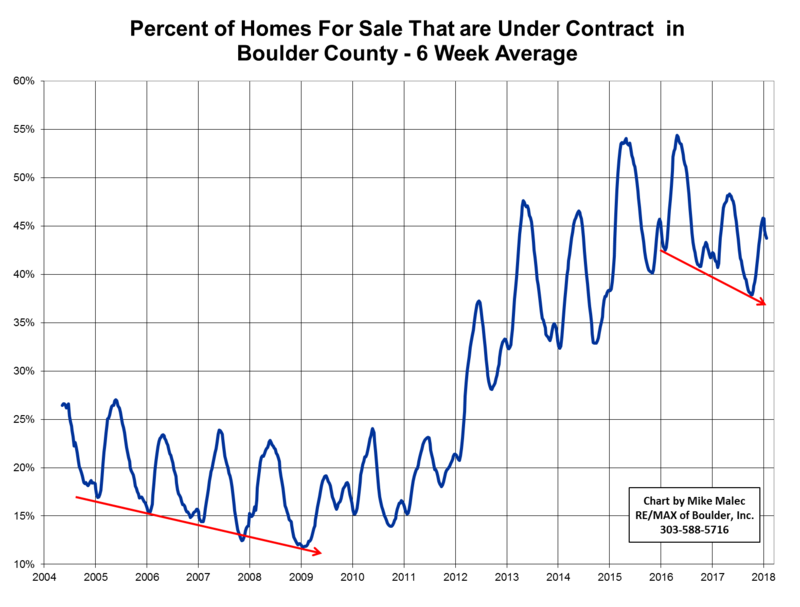 What we can’t predict though is if this current upward movement will be permanent or another buildup in rates that slowly deflates again like we saw in July 2013, early 2015 and again in early 2017. 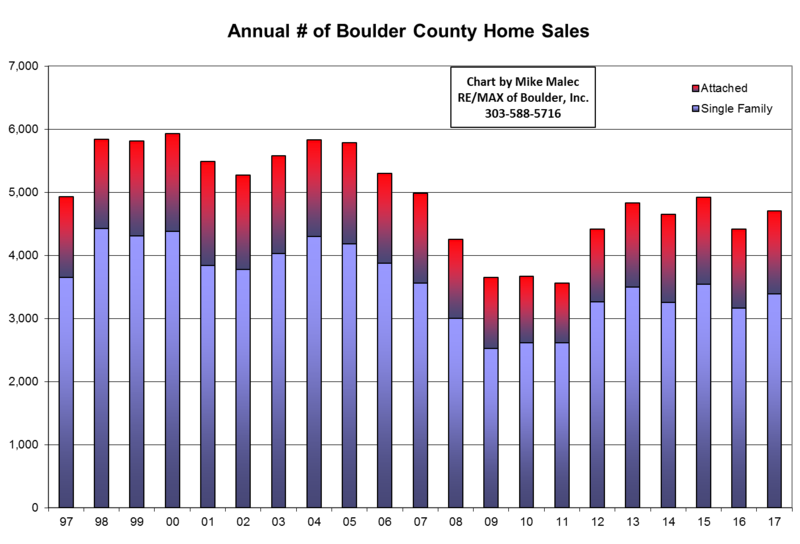 This is my one chart pulled from REColorado data showing the number of Boulder County sales recorded in REColorado over the last five years. 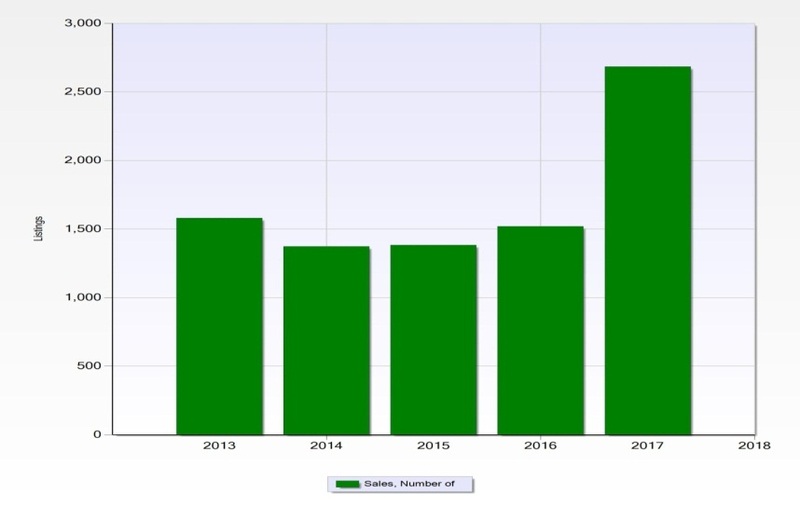 The large jump in 2017 is indicative to me of the many IRES-only brokers forced to join and entering their Boulder County listings and sales into REColorado. I’m sure this has affected our stats as I’m sure there are also REColorado-only brokers who felt they had to join IRES to get their Boulder County listings in front of Boulder County brokers. 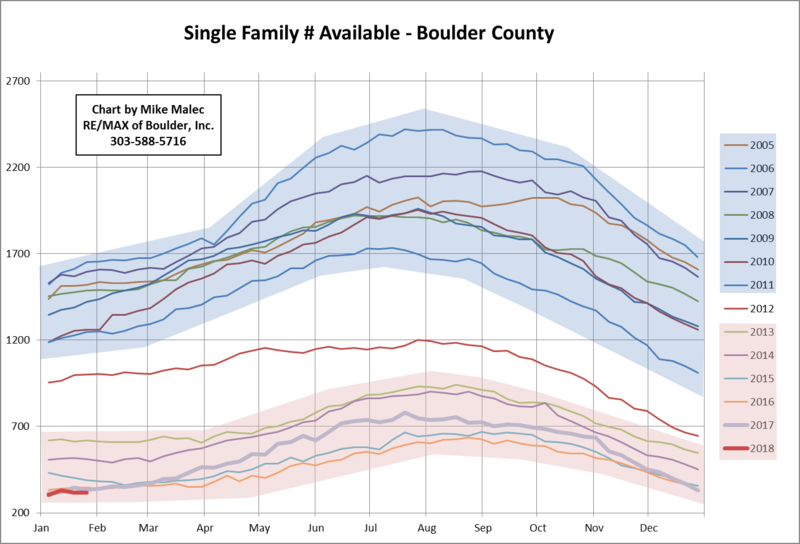 My few attempts at downloading from both systems and trying to reconcile the two data sets has shown me that I don’t have the time, energy or statistical chops to create charts incorporating every Boulder County sale. You also have other off-MLS sales adding to the complicated mix. Hopefully someday, we’ll have a merged Front Range MLS system that includes historical data from IRES and REColorado, but until then, we’ll keep plugging along with the data we have. Have an amazing 2018!